Today, ROI is everything – especially in a slumping economy. Are your current metrics giving you the full story? MarketingExperiments estimates that up to 75% of the data Web marketers collect are either misleading or inaccurate. And expertise with Web analytics is rare, according to our recent poll. Most marketers remain uncertain about what to measure, whether the results are reliable, and what steps to take based on their data. This brief covers the key steps to determining your essential metrics, with four critical elements to keep in mind. Weve also provided a tool you can use right away to improve your marketing ROI. However, years of experience are no fail-safe. A recent survey by Web Analytics Demystified of marketers who either perform their own analysis or get results from an agency found that their #1 concern was the ability to use the data for decision-making. Their #2 concern was accuracy of the data. Different analytic tools filter data differently when it comes to internal and external IP addresses, HTTP status codes, and categorizing anomalies and content. Security software can block ad server content and delete cookies. Ad tags may not be captured immediately; visitors can bounce away before pages fully load. PPC programs may put a time limit on counting visitors: A click on the same ad within a few seconds may appear as one visit, not two. Server logs may not be configured to capture all the information you need. Even if you’re confident in the results, collecting too much data or only applying a big-picture perspective has its own pitfalls. Both may obscure important results — the “diamonds in the rough” that point to significant ROI opportunities. The following case study illustrates this point. . . .
We recently performed a complex A/B test of both ad and keyword CTR for a partner that owns multiple domain names. Objective: Increase keyword and ad click-through rates. Primary research question: Which domain template design will produce a higher keyword CTR and ad CTR? The conversion paths for each test were set up identically . . .
Reordered keywords in navigation bar based on user searches. However, a more granular look at the data identified 24 “niches” of significant results . . .
What you need to understand: We were able to identify 24 “niches” where ad CTR increased from 5% to 248%, averaging 65%. Examining the data from a granular perspective showed several “hidden” opportunities to increase ROI that might have been obscured by looking only at the aggregate results. Based on the niche results, implementing the highest yielding templates from each test has the potential for significant increases in ad CTR. Let’s review another test where looking only at aggregate results could cause us to overlook data with major implications for ROI. . . .
We performed a variable cluster test for a business selling financial information subscriptions. The objective was to increase conversions to paid subscriptions. Primary research question: Which offer page will produce the highest sign-up conversion rate? Secondary research question: Which price point will convert best? What you need to understand: The actual difference had to be at least .05% to be statistically significant. Though the difference was not significant, we did find a recommendation we could make to our partner when we examined one key metric the test produced . . .
What you need to understand:When we looked at Lifetime Value (LTV) per Visit, ROI on annual payments was significantly higher than the monthly payment option: we noted increases of 872% in the Control, and 300% in the Treatment. Based on these results, the partner could improve ROI significantly by discontinuing the monthly payment option. Essential metrics are those that help you “fix the gap” between what visitors are already doing on your site and what you want visitors to do on your site. Here are the key steps that will help you identify and track those actions. Step 2: Understand there are really only four elements you can measure. The AMOUNT of activity on your site — page views, visitor sessions, returning visitors, etc. The SOURCE of that activity — referrers, search terms, languages, countries, organizations, etc. The RESULTS of that activity — click trails, most requested pages, number of page views, sign-ups, orders, etc. Key Point: Essential metrics are those that help you understand what someone was thinking as they moved through your site. If you simply note the action  report a number  without understanding the thinking behind it, you will not be able to optimize your site to its full potential. Step 3: Check the reliability of your data. Have at least two sources of information to help you compare results and more quickly identify anomalies and potential inaccuracies. For example, several marketers who use a licensed analytics program such as Hitbox or Webtrends, also use a free tool like Google Analytics. Step 4: Calculate the cost and yield of each desired action on your site. This calculation gives you the average revenue for each desired action. Detail of the MarketingExperiments’ Essential Metrics Tool’s YPx-CPx calculator. How much does it cost to get a single desired action (visit; sale; subscription; donation)? Include internal costs, such as staff time, supplies, and fees. What is the value of each action? Key Point: Start by identifying the traffic sources the channels that give you the highest ROI, the highest yield per visit with the lowest cost, and optimize them first. Key Point: Target metrics with the greatest potential impact on cost and yield. When you can identify and track essential metrics, you’re prepared to take the most critical step toward peak optimization: Anticipating the sequence of thought in the mind of your customer. It’s an easy and common mistake to think in terms of what your company wants (leads, conversions, sales) instead of what your customer wants. Once your numbers tell you the what, avoid the trap of stopping there. Now, you are in the position to do the real thinking. What you’re really trying to measure with essential metrics is your prospects’ and customers’ satisfaction level. For instance, bounce rate is really customer surprise or disappointment: The site was not what they expected, so they left. Anticipation of the customer’s thought process is the key to using essential metrics to fully optimize your site. By examining their actions, you can identify trends and patterns and find the areas of your site where improvements will produce the biggest ROI gains. The key to identifying and tracking essential metrics is to first understand your own business objective. 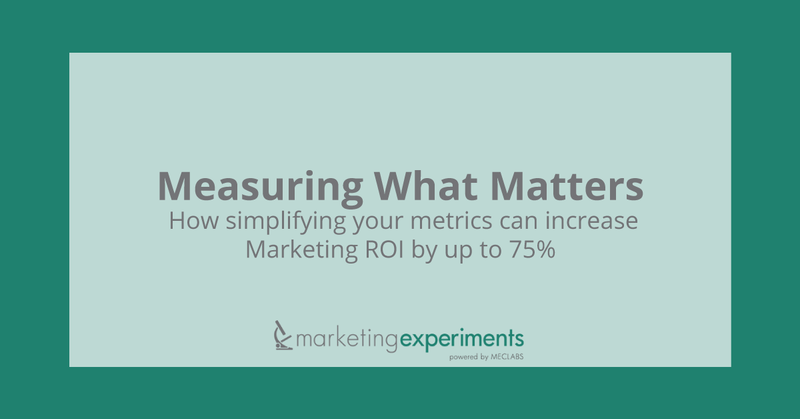 Essential metrics are the ones that lead to optimization decisions and action. You have to know what visitors are already doing on your site before you can effectively change your site and what visitors do when they land there. Target metrics with the greatest potential impact on cost and yield. Identify the traffic sources — the channels — that give you the highest ROI, the highest yield per visit with the lowest cost, and optimize them first. Never assume your metric system is accurate; carefully monitor for anomalies. Test, measure, and test again. Small increases can add up to a big ROI over time.